I think most of us have been seduced by the charms of Urban Decay. Their slick packaging, fabulous products and epic rebranding campaign have put them in the front running for best make-up label in my opinion. I don’t know anybody who doesn’t own at least one Naked palette at this stage! Given my endless love of UD, I was eager to try out the Naked Skin range-which is all completely vegan too, hooray! 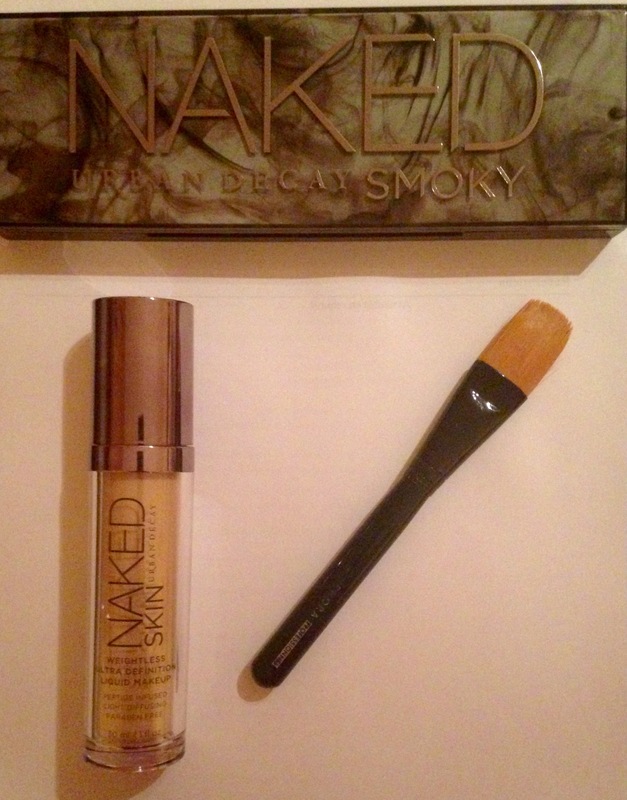 So, I purchased the Naked Skin Weightless Ultra Definition Liquid Make-Up during the week. The metallic packaging is very chic and there is a pump included in the price, something which is quite important to me personally. Do you guys feel the same about this minor detail? The bottle definitely looks the part on the dresser. The formula is liquid and quite thin. Initially, I worried about the coverage as the consistency is quite runny. However, the coverage is buildable on application, and the light infused particles do blur a multitude to deliver ultra definition. It would be impossible to make this formula look caked on and it feels like there’s nothing on my face. This is a great one for a no make-up make-up look. For best results use a fluffy make-up brush like the Karma Optical Blurring Brush, also from Urban Decay. Personally, I prefer more coverage and my skin definitely requires a concealer and some colour correction product underneath the foundation. Anyone with blemish prone skin may need to add more coverage and correction to correctly optimise that near naked glow, but this is definitely a great lightweight foundation. It is also oil and paraben free, which is great for keeping those pores clear, and it contains peptides to moisturise and disguise the signs of ageing. The product comes in 18 ‘meticulously calibrated’ shades. I feel that’s a fairly accurate statement as shade 2.0 was the closest colour match I have ever gotten to my skin tone in any foundation. It is pale, without being draining, and has a lovely golden undertone, which makes it quite warm. It’s safe to say the shade range is extensive, and there is definitely a shade to suit all skin tones. I like this foundation. It is very natural, great for daytime and I think it will be lovely in the summer. I am a fan of a lot of coverage however, so I feel very barefaced with this, even though it is long-lasting and delivers on all its promises. This is a great one for normal/combination skin. Blemish prone skin may require excess coverage, and even though it contains Matrixyl 3000, a powerful anti-wrinkle peptide, the formula is still oil free. I would advise any dry skinned peeps to check the suitability at the counter. All in all, it’s a nice one though. And it has positive benefits for your skin. Finally, a great lightweight for all you lightweights! 😉 At €34, it’s definitely worth it, as a little product goes a long way. Have you tried this foundation? Do you rate it?